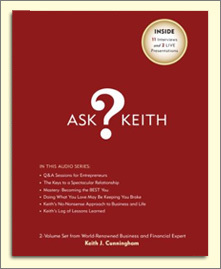 Ask Keith Interviews: This dynamic 3-part series has Keith addressing some of the most pressing questions entrepreneurs around the world have today. 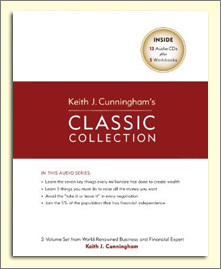 Keith Cunningham & Harv Eker - The Money Blueprint and Rebuilding Your Net Worth - In this tele-seminar with T. Harv Eker, #1 NY Times best-selling author of The Millionaire Mind, Harv and Keith discuss Keith’s money blueprint from when he was a youngster to today. Keith Cunningham & Joe Polish – The Next Level: Business Skills and Tools Required – In this interview with Joe Polish, Keith shares his insight on what will be needed in today’s marketplace in order to be successful in business. Keith Cunningham with Carolyn Ellis & Gloria MacDonald - The Keys to a Spectacular Relationship – In this interview, Keith presents powerful insights and ideas on how to create strong and successful relationships through creating mastery and being the best that you can be. Follow his lead and take your relationships to a new level. Keith Cunningham & Garrett Gunderson – Mastery: Becoming the Best You – In this phone interview, Keith shares his life story and the importance of Mastery and the need for commitment to mastery in one’s life. Keith Cunningham & Len Foley - Why Doing What you Love May Be Keeping You Broke – Listen as Keith discusses his take on doing what you love and why that may be keeping you broke! Keith Cunningham & Alex Mandossian – Raising Money: Tools, Strategies & Motivation for Raising Capital – Need to raise capital? Don’t miss Keith’s insights on what it takes to raise all the money you want. Keith Cunningham & Les Hewitt – Keith’s No-Nonsense Approach to Business and Life – In this riveting interview, Les Hewitt, founder of The Power of Focus, asks Keith the fundamental questions about his no-nonsense style and approach to business and life. Keith Cunningham & Ken Foster – Skills Every Entrepreneur Needs – The skills that it takes to be successful in business are applicable no matter where you live! Listen as Keith discusses some of the most important skills that every entrepreneur should have. Ask Keith LIVE: Keith’s Log of Lessons Learned – The Navy Seals keep a log of lessons learned that they continually add to after each mission. In this 2-part, live presentation, Keith discusses why he keeps his own Log of Lessons Learned. He will cover in depth some of the biggest lessons he has learned over his 35 years of being in business. Ask Keith LIVE: It’s NOT About the Strategy – Companies come together once a year to create their plans, goals and budgets for the upcoming year. In this live presentation, Keith discusses why it’s NEVER about the strategy.